This is a very fine cheddar cheese imported from England (Dorset coast). 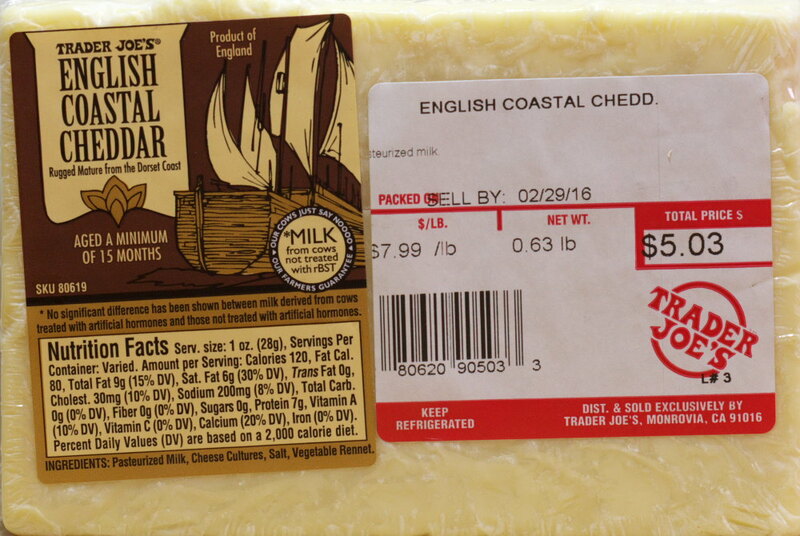 The cheese has a pale off-white color, not the usual yellow color found in US produced cheddar. This is not a “hard” cheese. It’s relatively easy to cut and a little crumbly. The cheese has a nice nutty flavor with a little bit of a tang. It’s not a sharp taste as might be found in a New York sharp cheddar, but still a very flavorful cheese. It reminds me a little of an aged Gouda, but not as hard. Similar to an aged Gouda you can feel (and hear) a few little cheese crystals crunch between your molars as you chew. Because of the pale color it’s difficult to see them in the cheese. I could easily get to like this. And I do. This entry was posted on 03/18/2016 at 20:18 and is filed under Recipes, food, cooking and related items, Trader Joe's. You can follow any responses to this entry through the RSS 2.0 feed. You can leave a response, or trackback from your own site. certainly a white cheese, but not a cheddar. it has low mild flavor. certainly not the same flavor level as any cheddar made in the us. for $7.99/lb. even store bought cabot block has more cheddar flavor and sharpness than this weak poorly aged cheese. Thanks for your comments. Although it didn’t come across in the review very well, I agree, this is different than many sharp cheddars made in the US. Have you tried Unexpected Cheddar? My wife’s favorite. No. I’ll look for some on my next trip there. Thanks for the recommendation.